Maybe the best way to bring these stocks back to life is to declare them dead. NEW YORK (TheStreet) -- Back in late 1981 or early 1982 one of the most popular magazines of that era had a cover story that read something like "The Death of the Stock Market." I remember it well, and I also recall that the stock market seemed "dead" for years. Well, as Mark Twain penned, "The rumors of my death have been greatly exaggerated." Hopefully the notion that gold and silver Stocks have kicked the bucket are also "greatly exaggerated." In fact, on my own "bucket list" is to live to see these stocks rise like the mythical Phoenix and soar spectacularly. On Friday some of the most prominent of the gold and silver stocks hit new 52-week lows. By market cap (over $29 billion) Barrick Gold ( ABX had an intraday low of $29.33 on huge volume. That's a new 52-week low, and the price is getting closer to the five-year lows that were experienced back during the financial fiasco of 2008 that gave us "the Great Recession." 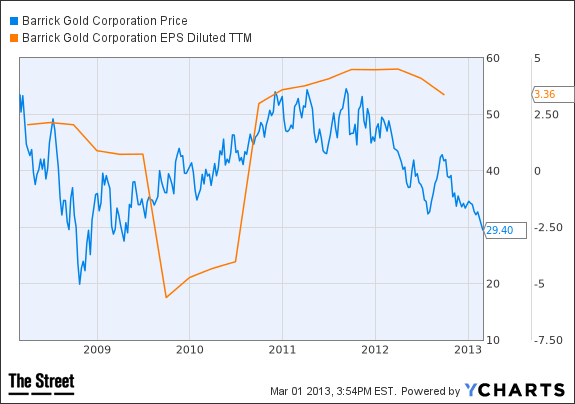 Here's a chart of ABX covering that time period -- look at the trailing 12-month diluted EPS line. Something smells fishy to me and I'm not writing after eating a lox and bagel sandwich. Now let's look at one of the bellwethers in the silver-producing world and one of my favorite ways to invest in the upside of silver, and that's the royalty-streaming company Silver Wheaton ( SLW, which finished on Friday at $31.75. Here's the five-year chart with the same metrics as we applied to ABX. This doesn't look like a chart that foretells the "death" of silver as a viable investment. Oddly, its price is higher right now then it was back in mid-2012, but it's well off its $40-plus price attained by the end of 2012. SLW is rated a "buy" here at TheStreet. On Thursday TheStreet's research dept. made the following observations on SLW: "The company's strengths can be seen in multiple areas, such as its largely solid financial position with reasonable debt levels by most measures, expanding profit margins, increase in stock price during the past year and notable return on equity. 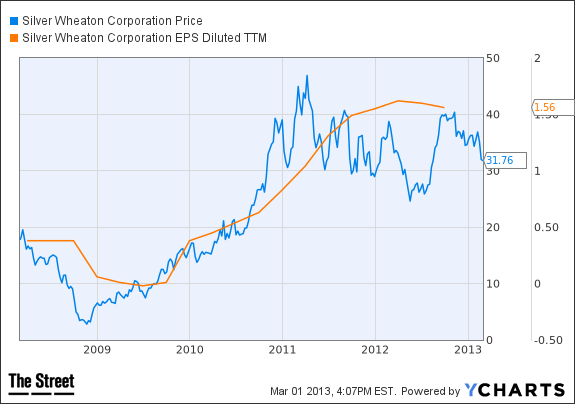 We feel these strengths outweigh the fact that the company shows weak operating cash flow." Some of the big hedge funds still are betting on the price of gold, even though a large number dumped most, if not all, their shares in Jim Cramer's favorite way to own gold, and that's using the SPDR Gold Trust ETF ( GLD - Get Report). GLD finished the week still clinging to life at $152.46 on average volume. Jim Cramer and Stephanie Link actively manage a real money portfolio for his charitable trust -- enjoy advance notice of every trade, full access to the portfolio, and deep coverage of the latest economic events and market movements. Legendary hedge fund manager John Paulson and his firm, Paulson & Co., remain believers in the future of gold. Paulson continues to hold the largest position in GLD with nearly 22 million shares, worth a jaw-dropping $3.344 billion. That's what most would call conviction. By the way, Paulson's firm still holds large positions in gold and silver producing companies like AngloGold Ashanti ( AU, which hit a 52-week low on Friday of $23.88 and finished the day at $24.05. As of Dec. 31, Paulson & Co. held 7.35% of the outstanding shares of AU, valued at nearly $885 million. Van Eck Associates Corp. owned over 4% of AU's shares worth, over $490 million as of the end of 2012. Now I'll let you in on my little secret. After the earlier mentioned magazine proclaimed "The Death of the Stock Market," the stock market began a bull market that lasted for 18 years and soared to new all-time highs. So if I proclaim "The Death of Gold and Silver Stocks" I just may be the catalyst that begins the next really big rally in said stocks. It's definitely worth a try, although the efficacy of it is questionable and I've been expecting that rally for weeks now. My crystal ball needs a good cleaning. I'll close by showing you a very interesting two-year chart of a gold miner ETF that you probably haven't heard much about. 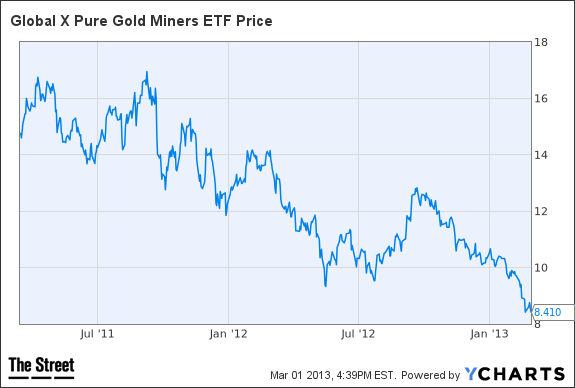 The Global X Pure Gold Miners ETF ( GGGG also hit a new 52-week low on Friday. All I can say is this little ETF, much like its really big competitor the Market Vectors Gold Miners ETF ( GDX, officially hit the two-year nadir (bottom) in share pricing. These ETFs have a barely detectable pulse rate, and the financial paramedics have been called. Maybe, just maybe, this is the contrary indicator so many of us have been waiting for. Or, maybe gold and silver stocks and the entire sector are comatose and waiting for a kiss from Prince Chow Mein? Having recently anointed myself the Prince of Chow Mein, I officially "kiss the sector" and await her awakening. Prince Charming, if you read this, please kiss "her" as well. Good luck to us all! At the time of publication the author had positions in ABX, SLW and GDX. EXCLUSIVE OFFER: Jim Cramer's protege, Dave Peltier, only buys Stocks Under $10 he thinks could potentially double. See what he's trading today with a 14-day FREE pass.